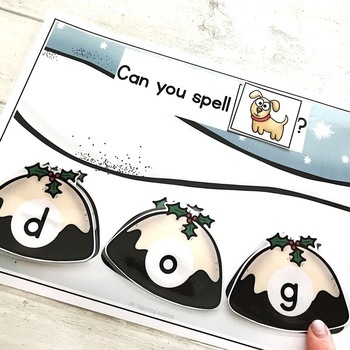 This Christmas pudding activity is a fun and engaging way for students to work on their CVC skills. 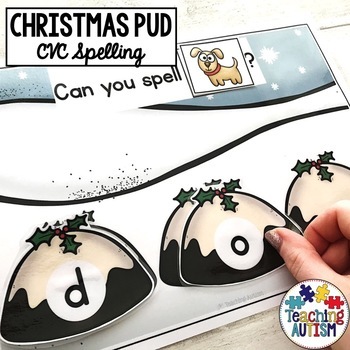 Students use the matching Christmas pudding letters to spell out the CVC words shown. The resource comes with one 'main page' which I recommend laminating. The page contains a gap for you to put the included image of a CVC word. 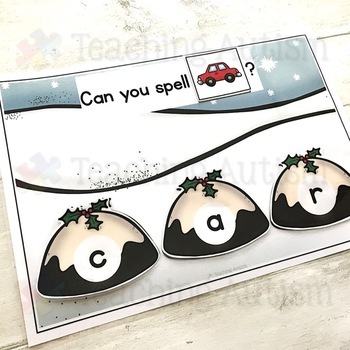 Learners recognize the image and use the Christmas puddings to spell the word. This is a great hands on resource for your students to work on their spelling skills. It also helps bring to some Christmas fun into your learning environment. • Take it in turns to put an image card on top of the base board. • Students look at the image shown of the CVC word. Then they use the Christmas pudding letters to spell out the word. This resource comes in both b/w and col. option for your printing preference.